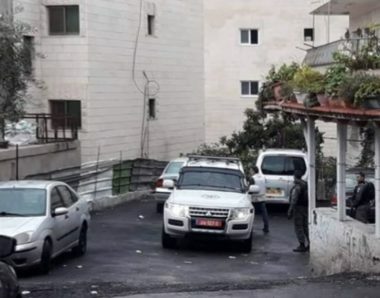 Israeli soldiers invaded, Friday, the al-‘Isawiya town, in occupied East Jerusalem, stormed many neighborhoods, and photographed many homes, buildings and streets, before handing demolition orders targeting several buildings, and summoned many owners for interrogation. Mohammad Abu al-Hummus, a member of the Follow-Up Committee in al-‘Isawiya, said the soldiers, and personnel of Jerusalem City Council, posted orders for the demolition of several homes and buildings, which were constructed many years ago. Mohammad said the owners have been paying high fines to the City Council, and have already submitted licensing applications despite the excessively high costs, and are still awaiting a response. He also stated that the City Council distributes demolition orders every week, during extensive invasions by the soldiers and the police, an issue which is impacting the daily lives of the Palestinians,who cannot feel safe at home due to the constant threats of displacement. While the Palestinians in occupied Jerusalem continued to be denied construction permits, and face repeated demolitions,displacement and ongoing excessive violations, Israel continues to build its illegal colonies in the city, and the rest of the West Bank, in direct violation of International Law.